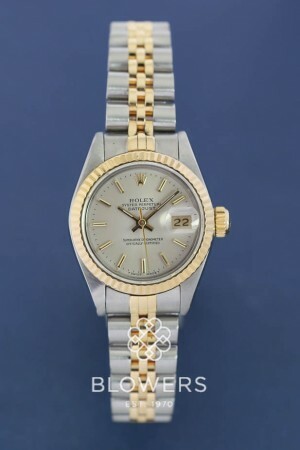 Steel and gold Rolex Oyster Perpetual Datejust mid-size 68273. Steel and gold Rolex Oyster Perpetual Datejust mid-size 68273. Case diameter 31mm water resistant to 100 meters. Fluted bezel. Black dial with Index hour markers. Steel and gold bi-metal Jubilee bracelet with folding clasp. Watch Only. Circa 1986. SKU: 3004070. Categories: Datejust & Date, Ladies, Rolex.